” Chatan-cho” is an open area with its comfortable breeze just like West Cost of the United States. The hotel is located right next to the Miyagi coast that has a unique atmosphere by the wall painting on breakwater. During the day time, divers and surfers walk around the coast line wearing a wet suit. In the evening, a lot of people come to the coast line to see the sun set in the East China Sea. 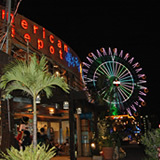 If you go by the line a little far, you will come across Mihama American Village and Hamby, famous with its flea market, with a lot of foreigners and youngsters. 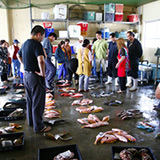 Chatan-cho is the best place for marine sports and tourist activities.